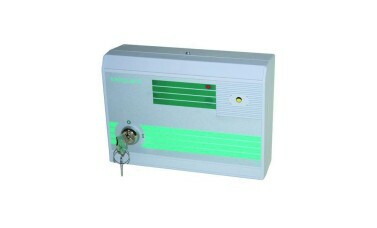 This EXITGUARD uses a two position keyswitch for setting the alarm. The integral sounder has two selectable tones to enable the alarm condition to be distinguished from any other alarms in the vicinity. Hi, guys. My name's Darrel and I'm head of the tech team here at LocksOnline.co.uk. Thanks for taking some time to tune in and look at one of our product review videos. The product that we have here in front of us today is the Hoyles ExitGuard. It's the key-operated version of the ExitGuard. They do, do one with a keypad, but this is the basic battery version Hoyles ExitGuard. Now, what you use these for is on doors where, say, in a commercial building or something like that where somebody is going out through a back door or through a fire escape door and, to be honest with you, they shouldn't be doing it. And you want to monitor as to whether or not people are going in and out through that door on a regular basis, or you want to raise an alarm if somebody tries to get out through that door. It could be the back of a shop where somebody could be taking stuff and going out through the back of the shop or something like that. As soon as they open the door, you can get this to set off, and it will then alert you to the fact that the door is open. So there's nothing really magic about that. That's what it's designed to do. This is one of the most basic versions of them all, and like I've said it works off battery. So, in the box when you get it, it will come with a set of batteries. Out comes the stand, right there, you get yourself the batteries that are required. You get the fixing kit that comes with it as standard and obviously the keys to reset it as well should you want to, if it goes off and you need to actually reset it after. So, that's the keys there. That's fine. That's not a problem at all. It comes with two keys. And this is the actual contact, then, that it comes with as standard. And this particular contact is what you fit on the door. And you would run the cable and you would probably fit this then by the side of the door or on the top of the door. Wherever it suits the application. Of course you don't need any mains to it because it's battery powered. It also comes with a little sticker, as well, that you can put on the door. There's the little sticker, there, that comes with it as standard, so you can stick it on the door to say that the door is being alarmed. It also comes, as well, with the fitting instructions there and on there as well. Now, I'm going to mention a few little things that it does. You can get it to chime. So, every time the door opens, you can get it to chime. That's one of the facilities. You can get it to delay as well. So, for an example, if you open the door for a short period of time and then close it again because you're using it on a regular basis, then you can actually impose a delay before the alarm is raised and that's sometimes quite handy, if you want to. You may not want to, but it has that feature to do so. So, those are a few of the different features that are available. And, of course then, you can also have it so after a pre-set period of time the alarm will stop, as well. So, I've gone a little bit stage further and I've actually undone the screw to actually show you guys inside. So, for fixing it to the wall there's loads of fixing slots here where you can actually drill and fix this to the wall. There are ones there, there's one there, there's one there, and there's one just up in there, as well, if you can see that up in there. Obviously, this is where your batteries would go. And, this is the actual circuit board. I'll see if I can zoom that in there like that. And that's the circuit board. There's a tamper here that you can use, so it comes with a spring in here. The idea is that if somebody tries to tamper with this by bypassing it then the alarm could be raised as they try to take the cover off. That's what the tamper is for. And along here, then, you've got the tamper as well to the cable, so if anybody tampered with the cable to try and bypass it, then the alarm would go off. And there's the contacts would go in there then in regards to the actual contacts. When the door's open, then, it would raise the alarm. So, that's all the settings. And, here are the different settings up here. You've got the chime setting up here. You've got the delay setting here, as well. It's just to move the jumpers around, depending on what type of delay that you want. And, of course, it's got an option for changing its tone as well. All right? And here is the potential-ometer that allows you to adjust the time that the alarm goes off for. And, of course, then it's key-operated from the outside. There's the buzzer there. And, of course, then it will have a little flashing LED when it goes off as well. So, there you go, guys. This is the key-operated Hoyles ExitGuard. 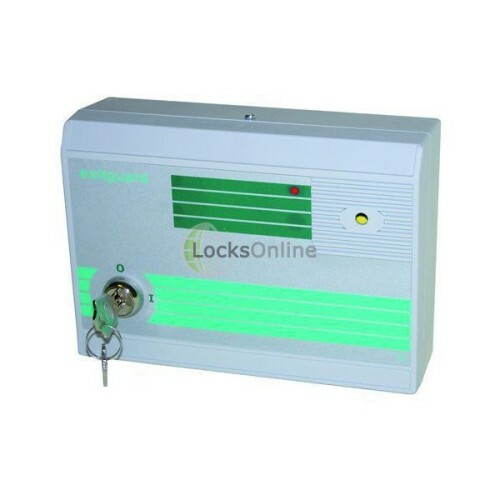 It's available at LocksOnline.co.uk. But, listen, if you need a bit more information, you want to know a little bit more about it, use our live chat on our website. It's really cool, and you can just chat with me or any of the guys on the sale team. And, we'll try and help you out the best we possibly can. But, in the meantime what we'd love is to see you guys as a customer. That would be really appreciated. So, from me, Darrel, and all of us here at the LocksOnline team, take care. And, take care and bye-bye. Bye-bye now.